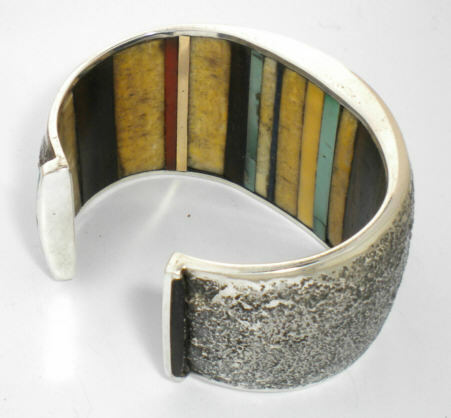 This is the Charles Loloma bracelet I gawked at and even (yes) tried on at Bahti Indian Arts (http://www.bahti.com/) while in Tucson. An incredible piece by an incredible master jeweler. It's selling price is a fair $22,000. It was like being able to touch a VanGogh painting. It is tufa-cast and inlaid with lapis, ivory, gold, ironwood, coral and turquiose. Charles Loloma was Hopi and worked in the 50's, 60's & 70's. It is hard to describe when an artist's work touches your soul. But I am so inspired and so grateful.